During the time that they were separated, Mariana became an independent and ambitious woman, savvy in real estate and other matters. She formed a partnership with a younger man, Carlos Lavalle, buying property, constructing homes and selling them. She and Carlos started a brickyard which was very successful. Carlos also fathered several children with her: Josefa Maria, Julian, Andres Antonio and Josefa Candalaria, all born between about 1798 and 1806, and all mentioned in her will. Her children with Joseph Bonifay were named in this order in her will: Carlos, Maria [Marie Louise, from whom I descend], Manuel, Josefa [Josefa Eugenia], Margarita, and Jose [Joseph]. Mariana was unusual for a woman of her time. She owned several tracts of land, many around the area of Gull Point, also known as Pt. Diablo, on Escambia Bay. Near the end of her life she wrote her will, dated 16 September 1825. She died 12 September 1829, most likely at her country home on Escambia Bay.8 We might assume that she was buried in St. Michael’s Cemetery, but there is no record. There is, however, a marker, erected in 1967, in the median on East Garden Street, just before Alcaniz Street that borders the west side of St. Michael’s Cemetery. Coker, William S. and G. Douglas Inglis. Spanish Censuses of Pensacola, 1784-1820: a Genealogical Guide to Spanish Pensacola. Pensacola: Perdido Bay Press, 1980, p.37. Sutton, Leora M. Mariana Bonifay. Pensacola, Florida, privately printed manuscript, 1961, p.6. Will of Mariana Bonifay: Florida Probate Records, 1784-1990, FamilySearch.org database, Will Book 1, 1832-1898, pp. 15-17, FHL MF 941009, images 40-41. Will of Mariana Bonifay: Florida Probate Records, 1784-1990, FamilySearch.org database, Will Book 1, 1832-1898, pp. 15-17, FHL MF 941009, images 40-41. I have looked at marriage records for Santo Domingo for 1774, 1775, but could find no records for 1776 and no record for their marriage. Coker, William S. and G. Douglas Inglis. Spanish Censuses of Pensacola, 1784-1820: a Genealogical Guide to Spanish Pensacola. Pensacola: Perdido Bay Press, 1980. Marie Louise Gonzalez was 40 in the 1820 Spanish census of Pensacola, p.124. On the Find A Grave website, her birth year is 1781. Sutton, Leora M. Mariana Bonifay. Pensacola, Florida, privately printed manuscript, 1961, p.5. Sutton, Leora M. Mariana Bonifay. Pensacola, Florida, privately printed manuscript, 1961, p.19. Obituary of Marianna Pingron Bonifay: Pensacola Gazette, Pensacola, Florida, Tuesday 15 September 1829, p.3. The obituary notes that she died on Saturday, putting her day of death on the 12th of September. 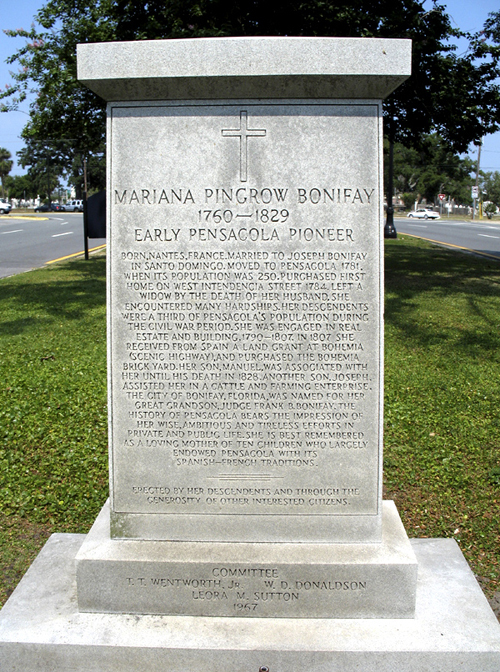 Photograph of the Mariana Bonifay marker taken by the author in 2007. Photographs and web page content,Copyright © 2002- , Anne Field, all rights reserved.